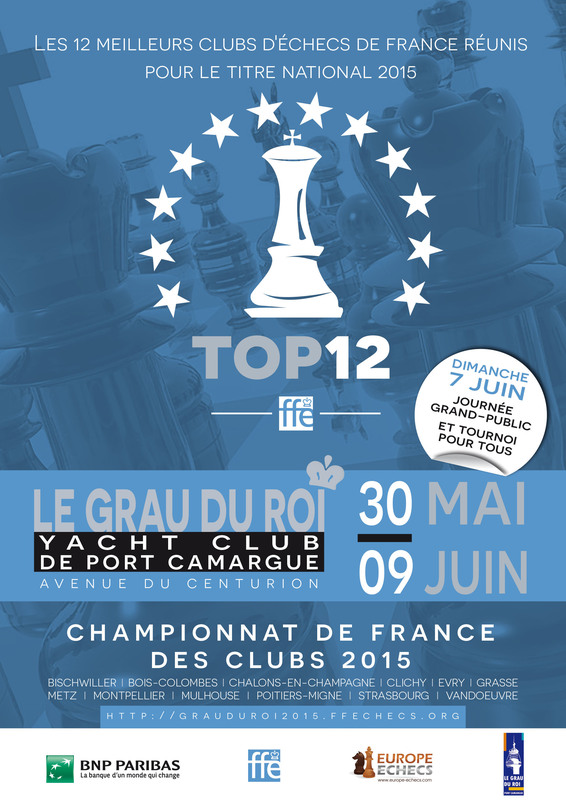 ChessBomb Blog: French Top 12 Club Chess Championship 2015: LIVE! Round 1 Saturday, 30/05/15 4:00 p.m. Round 2 Sunday, 31/05/15 3:00 p.m. Round 3 Monday 01/06/15 3:00 p.m. Round 4 Tuesday, 02/06/15 3:00 p.m. Round 5 Wednesday, 03/06/15 3:00 p.m. Round 6 Thursday, 04/06/15 3:00 p.m. Round 7 Friday, 05/06/15 3:00 p.m. Round 8 Saturday, 06/06/15 3:00 p.m. Round 9 Sunday, 07/06/15 3:00 p.m. Round 10 Monday, 08/06/15 3:00 p.m. Round 11 Tuesday, 09/06/15 2:00 p.m.